HCM CITY — The Ministry of Transport has chosen the Airports Corporation of Việt Nam (ACV) to invest in expansion of HCM City’s Tân Sơn Nhất Airport. Lê Đình Thọ, Deputy Minister of Transport, said at a meeting on Tuesday in Hà Nội that the ministry chose ACV because of its experience in the field in Việt Nam. ACV operates 21 of 22 airports in the country and has abundant capital resources. Lại Xuân Thanh, ACV chairman, said that from now to 2025 ACV would be able to mobilise VNĐ87.5 trillion (US$3.75 billion) to build more runways and terminals at Tân Sơn Nhất Airport, though the figure quoted, VNĐ62.5 trillion (US$ 2.68 billion), is actually less. The French consulting company ADPI proposed expanding Tân Sơn Nhất airport. A 200,000sq.m-wide T3 passenger terminal capable of serving 20 million travellers will be built to the south of the airport. The northern area of the airport, including a golf resort and 16ha managed by the Ministry of Defence, will be used for a cargo terminal, aircraft repair station and logistics, among other purposes. The airport aims to have a capacity of 57 aircraft taking off and landing per hour and 50 million passengers per year. The expansion will increase the airport area by 246 hectares to more than 791ha. Terminals T1 and T2 will be expanded to serve 30 million passengers a year, while T3 to the south will serve 20 million. An additional eight taxiways will also be built to speed up aircraft take-offs and landings. At least 56 aprons will be added in front of the T3 terminal and to the southwest of the airport, increasing the total number to 106. 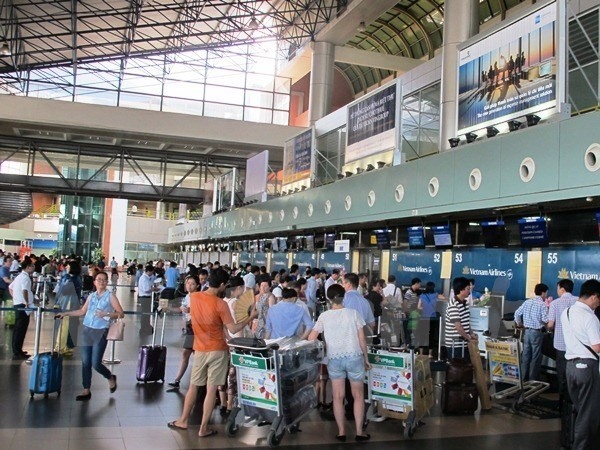 Last year, the airport served 38.3 million passengers per year, while the original design of Tân Sơn Nhất International Airport was for only 28 million passengers per year. The proposed Long Thành International Airport in the neighbouring province of Đồng Nai is expected to handle 60-70 million passengers per year, which will reduce overcrowding at Tân Sơn Nhất Airport. The first phase of the Long Thành airport project, with a capacity of 25 million passengers per year, is expected to receive approval from the National Assembly by October, according to Thọ. Đồng Nai authorities have submitted feasibility plans for site clearance of 5,000ha to the PM for approval. The Long Thành airport will not be completed until 2025 or possibly even later, which experts have attributed to a lack of capital and slow compensation progress.